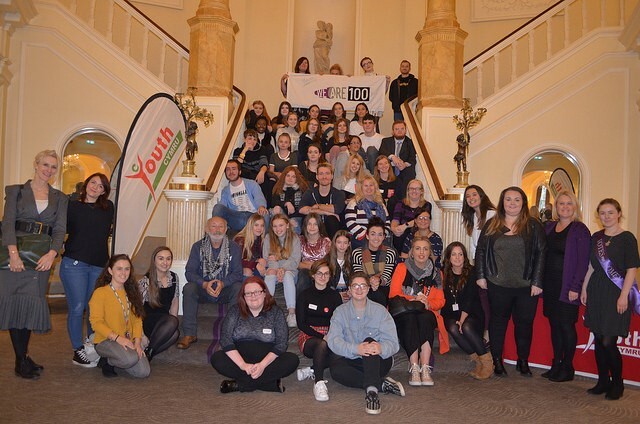 On Monday 12th November, our We Are 100 Project came to a close with a fantastic celebration Unconference at The Angel Hotel, Cardiff. 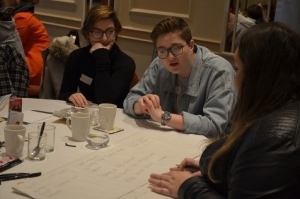 The aim of the day was to celebrate the amazing achievements of the 60 young champions from Merthyr Tydfil and Swansea YMCA who led their very own social action projects to peer educate their communities on the Suffrage Movement, and the importance of using your voice to make changes in society. Our Merthyr Tydfil champions were a mix of young people from Gellideg, Soar, Georgetown, Willows, and Aber Arts. 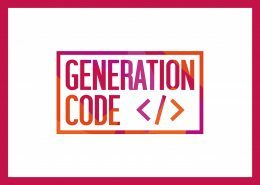 Together these youth clubs collaborated, running engaging and interactive workshops with their young people from August through to November, all around the toolkit. 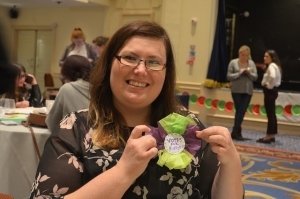 In October, they held a showing of the film ‘Suffragette’, and also had a historian visit from Cyfarthfa Museum where they learned all about the local history of Suffragists in their area. 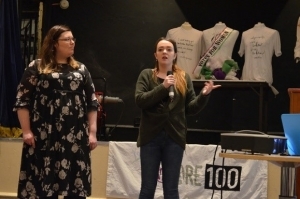 The thorough research they had carried out on Suffragist Rose Mary Crawshay from Merthyr Tydfil, later became the focus for their Social Action Presentation, which took place at Theatr Soar on the 8th November. 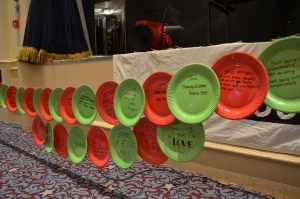 The Presentation evening was creative and educational, there were dramatic readings, art displays, and songs all prepared by the young people with help from their youth workers. 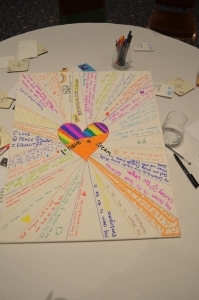 The We Are 100 Suffragette Project at YMCA Swansea consisted of working with 30 champions in many different creative ways. 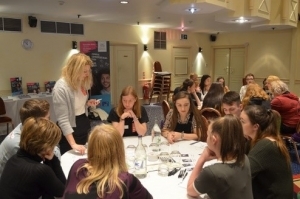 This included recruiting young champions from the local community to take part in an inclusive theatre project, utilising young people’s performance and production arts skills. 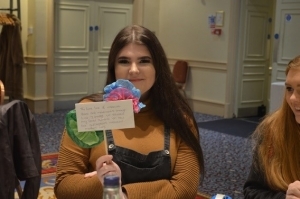 Additionally they engaged their Young Carers Group at YMCA Swansea to create Art Pieces to auction at the ‘100 Years of Suffragettes Celebration’ event hosted in the Llewelyn Hall Theatre on the 29th October 2018. 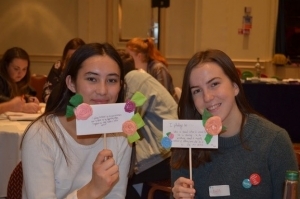 The event consisted of talks on the Suffrage Movement as well as a devised performance piece created by participants who engaged with the overall project. 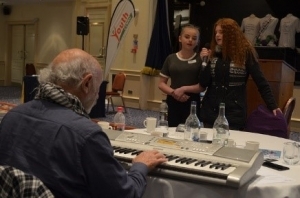 Additionally Young Champions performed solo songs that they had composed as part of the project and also sang other songs relating to the theme. 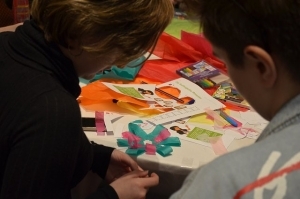 The event finished with a charity auction of art pieces created by Young Carers at YMCA Swansea. 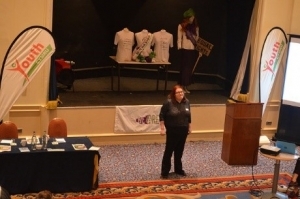 Alongside the performance participants displayed a suffragette exhibition provided by Swansea Council. The overall performance was well received by all attendees and in total £200.10 was raised for YMCA Swansea, which was fantastic! 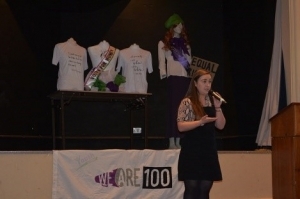 The day started with the launch of our WE ARE 100 Suffrage Youth Toolkit. 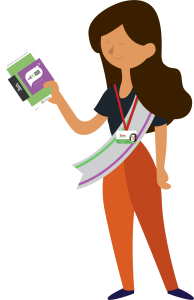 A resource filled with interactive sessions to teach young people about the history of the Suffrage movement, the history of democracy in the UK, and the importance of having a voice as young people in today’s society. 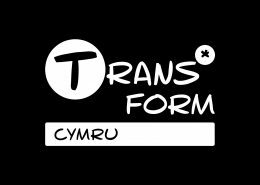 We then presented our Human Library video, made in collaboration with Swansea YMCA Good Vibes LGBT group, and EYST Swansea Young Women’s group. We attended two sessions to film the young women and consult with them about social issues today. 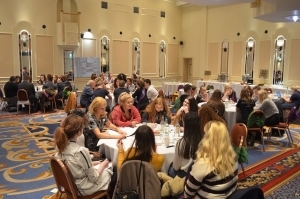 The aim of the Human Library video and consultation was to enable our participants and attendees to listen to diverse young women speaking about their perspectives on issues such as women’s place in society, barriers for young people getting into politics, The importance of voting, and feminism. Human library video coming soon! 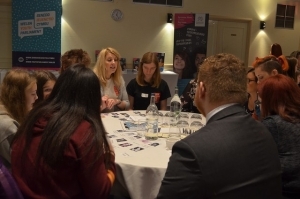 Our World Café was set up involving different agencies, to talk about the work they are doing around the important themes of the day. This is your choice- what do you want to talk about, discuss, challenge, share expertise and best practice. 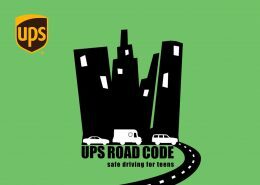 What social issues do we face in our lives? What do you think is important to discuss? What equal rights do we want to have? What has the suffrage movement done for us? Is it important to learn about the movement? What would happen if the votes at 16 became a movement, would there be the same reception? Would campaigners use the same methods as the Suffragettes? 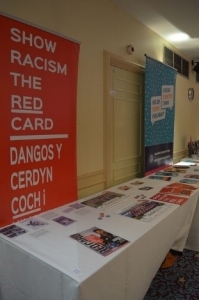 Show Racism the Red Card is an anti-racism education charity which delivers workshops for young people and adults across Wales. 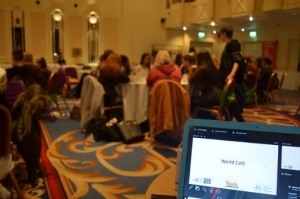 At the world café we have activities based around stereotypes, advancements made by women and some facts about the suffragettes which may surprise you. 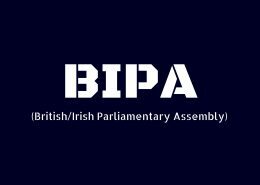 The activity will look at the key social and legislative changes in LGBT+ rights in the past 60 years. When and how were these rights won? What battles for LGBT+ rights are still being fought and what can we do to support LGBT+ equality? 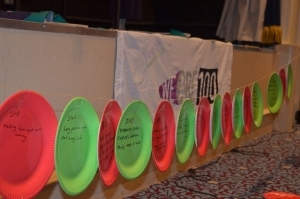 What do you think are the important issues for young people living in Wales? Do you know how you can get your issues heard by decision makers? 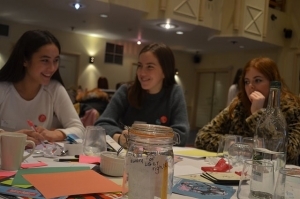 Come and find out how the National Assembly for Wales works in giving young people a voice on issues they think are important, including finding out who your Assembly Members are, how to start a petition and contribute to Committee Inquiries. 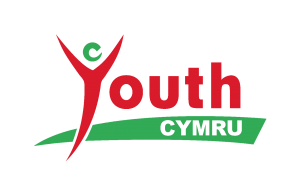 You can also find out how the brand new Welsh Youth Parliament will work and how young people can get involved! Think about a dream you have for society. What would a perfect world look like for you? Think about some of the things you have learnt and discussed with others today. Are there some social issues that you weren’t aware of? Are there thing you could change in your everyday life to benefit others? 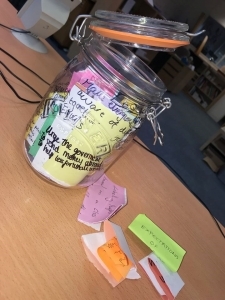 What jars you about gender and sexuality in society today? What needs to change to turn what is unfair to fair, for an equal and more inclusive world? Think of a time when someone did something that you didn’t like, or a rule, advertisement, or tweet that offended you or someone close to you. What should we stop doing, and what should we start doing instead?